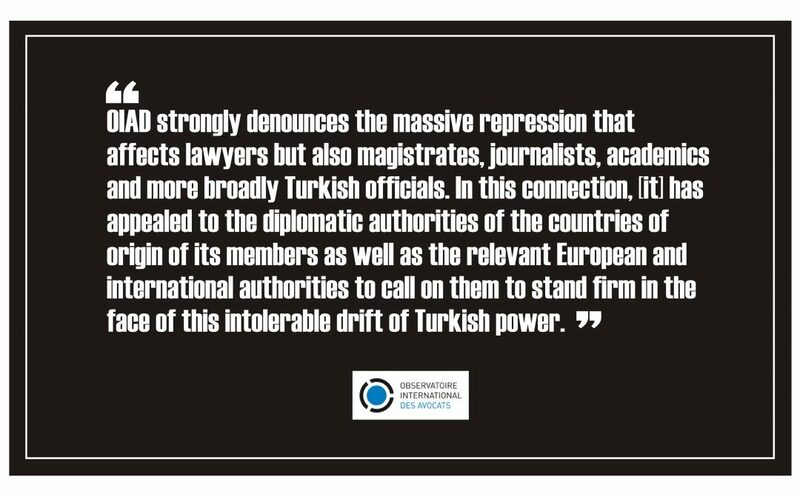 The International Observatory for Lawyers at Risk (OIAD) on Tuesday issued a statement expressing alarm over the intensification of repression carried out by Turkish authorities against lawyers and calling on the government to respect the international conventions to which Turkey is a party that protect basic human rights and ensure the ability of attorneys to fulfill their professional duties without fear of government interference. The statement released by the OIAD, an initiative of the French National Bar Council, the Consejo General de la Abogacía Española (Spain) and the Consiglio Nazionale Forenze (Italy), notes that in March a Turkish public prosecutor issued arrest warrants for more than 80 lawyers acting in defense of clients accused of belonging to the Gülen movement, adding that 362 lawyers are currently in custody in Turkey and 967 are being prosecuted. “Since the collapse of the 15 July 2016 coup, the Turkish Government has conducted an unprecedented purge within the state apparatus, as well as within the academic and judicial system and against journalists. More than 41,000 people have been arrested in the past 6 months, and nearly 135,000 people have been suspended or dismissed,” said the report. The OIAD states that in addition to arbitrary arrests and torture in detention, according to numerous testimonies, and beyond those prosecutions based solely on the assimilation of a lawyer to the cause of his client, Turkish authorities are also seeking to “permanently weaken the independence of the legal profession through disturbing legislative measures,” among them the closure by decree of 370 civil society organizations, including many major lawyers’ organizations, especially those working in the field of human rights, on the pretext of alleged links to terrorist organizations. Further provisions of decrees issued under an ongoing state of emergency declared after the failed coup in July mandate the recording of conversations between lawyers and clients accused of “terrorism,” the presence of a guardian during their interviews and the regulation of documents exchanged between them. Additionally, the judge may abolish the visits of lawyers for six months if deemed necessary.